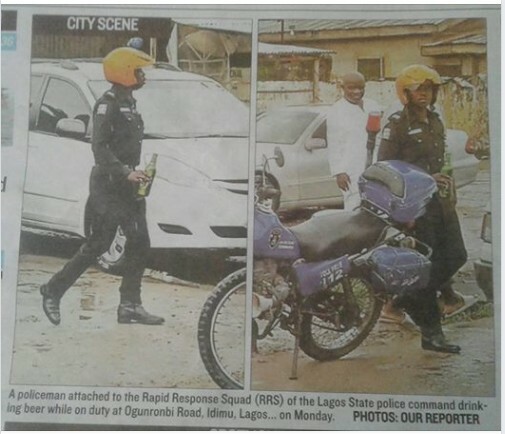 The attention of the Commissioner of Police, Lagos State, CP Edgal Imohimi has been drawn to a publication on page two of the Guardian Newspaper of Wednesday September 12, 2018, in which a police Inspector was caught on camera holding a bottle of beer. The officer in question has been identified and arrested. He is Inspector Emmanuel Egba, a police motorcycle rider attached to Area ‘M’ Command, Idimu and NOT Rapid Response Squad (RRS ) as erroneously reported. When the Inspector was questioned by senior officers, he denied the allegation; stating that he recovered the beer bottle with liquid contents from a driver who was drinking right inside his car in traffic. He feared that the driver might get himself intoxicated thereby endangering his life and that of other road users. The case is however being investigated at the Command Provost Section and if his claim is found to be false, appropriate disciplinary action will be meted out to him after an Orderly Room Trial.